Ch-Ch-Ch-Chia! If you we re around in the 80s your first association with chia seeds was probably the same as mine, that is that they are for growing weird little grass pets. I have to admit that because of this association I was at first skeptical about eating them when they started to get popular. Nowadays chia seeds are toted as a nutrition superstar, capable of everything from controlling hunger and aiding in weight loss, hydrating you, fueling your workouts, and fighting cancer and heart disease. One tablespoon of chia seeds contains approximately 60 calories, 5 grams of carbohydrate, 5 grams of fiber, 5 grams fat, and 2 grams of protein. Most of those 5 grams of fat are from polyunsaturated fats, specifically alpha-linolenic acid (ALA) which is an omega-3 fat. It’s probably not new news to anyone these days that omega-3 fats are full of health benefits including promoting heart and brain health. In those 2 grams of protein are all of the essential amino acids, making them a complete protein source and a good option for vegetarians in particular. In addition, chia seeds are a good source of calcium, phosphorus, manganese, magnesium and zinc. That’s quite the nutritional punch! So what about sports performance? The omega-3 fats in chia seeds are anti-inflammatory, meaning they could be helpful with recovery from strenuous exercise. Chia seeds were supposedly used for energy by the Tarahumara Indians of Mexico, who were said to be able to run hundreds of miles after drinking chia seeds soaked in water. Chia seeds can help with hydration, as they are highly absorbent. Soak chia seeds in a glass of water for 10 minutes and you’ll see how much they soak up the water, becoming thick gelatinous blobs. Gross? Kind of, but this is why they are able to help with hydration. Chia seeds also contain magnesium, which is thought to help with muscle cramping, another possible benefit for athletes who struggle with cramping. So chia seeds could be beneficial for athletes, although studies on sports performance and chia seeds are scarce. And what about all the other hype? Chia sees are said to help with weight loss and feeling satiated. They are high in fiber, which can help aid weight loss by helping you feel fuller longer. It’s also believed that because chia seeds expand in water they can help create a feeling of fullness as they expand in your stomach. Chia seeds (and all seeds really) are pretty calorie dense however, so the calories can add up pretty quickly. So if you are watching your weight stick to 1-2 tablespoons per day. Chia seeds are a good source of antioxidants, which help eliminate free radicals in the body. Since free radicals may cause cellular changes that could lead to cancer, chia seeds could potentially be helpful with cancer prevention, but this by no means guarantees that eating chia seeds will prevent or cure cancer. They could, however, along with other antioxidant packed fruits and vegetables, help form the base of a healthy diet that would provide potential cancer protection benefits. As I mentioned above chia seeds contain omega-3 fats, which is why they have been linked to a decreased risk of heart disease. Omega-3 fats help raise the HDL or “good” cholesterol as well as lower trigylcerides. Because they are anti-inflammatory this means they can help reduce inflammation in blood vessels, thus helping stave off heart disease. Unfortunately the only omega-3 that chia seeds contain is ALA, where as the omega-3s DHA and EPA have been correlated with greater health benefits. Some ALA is converted in the body into DHA and EPA, but it may be best for heart health to eat foods that contain DHA and EPA, such as fish. Chia seeds are certainly packed with nutrition and may provide some benefit for weight loss and heart health, however studies on this are limited. Chia seeds are not a superfood though, because there are no superfoods! Sorry to burst your bubble, but there is no one magical cure-all food. It’s best to aim to eat a wide variety of foods, since different foods contain different nutrients. That being said, because chia seeds are highly nutritious they are worthwhile to incorporate into your diet. Chia seeds are a bit pricey. I paid about $17 for a 15 oz bag (35 tablespoons). Granted they were organic and I bought it at Whole Foods so I’m sure there are better deals to be had. A little bit goes a long way though, as 1-2 tablespoons a day is sufficient. If you want to try chia seeds for sports performance, consider soaking them in water and drinking them as part of your pre-workout fluids. Remember never to try anything new on race day! Make sure to experiment with this on training runs or rides first as the fiber could cause GI distress for some people. Chia seeds can be eaten raw or cooked, ground or whole. Unlike flaxseed, the human body is able to digest whole chia seeds. They can be sprinkled on top of oatmeal, yogurt or salads or even baked into breads and other baked goods. Beware that chia seeds have a tendency to stick to your teeth when eaten in oatmeal and yogurt! Or try this delicious dessert recipe that contains my last “Should You Eat” blog topic as well, chocolate! Put in a blender and blend until smooth. Divide amongst 4 small bowls or cups and put in fridge to thicken. Pudding will thicken in about 10 minutes in the fridge. 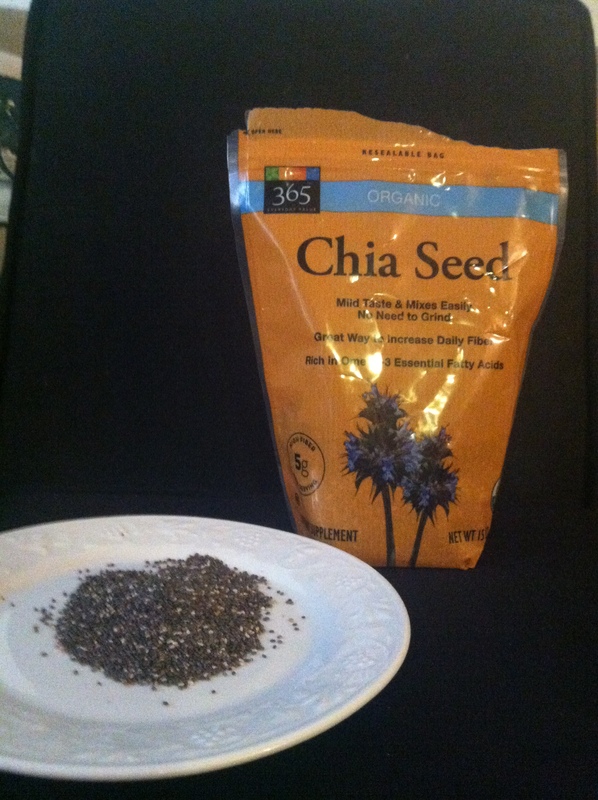 This entry was posted in Should You Eat.... and tagged chia seeds. Bookmark the permalink. ← Can You Improve Your Pain Tolerance?